AMOB Electric NC tube bender MDH Series is our standard-issue range. Simplicity, strength and accuracy are the key features of this especially relevant cost-effective line. Ideal for prototyping or small to medium projects. The MDH Electric Tube Bender are easily adapted to each different industrial and non-industrial situation. Covering a range from 10mm up to 90mm OD, these versatile bending machines are an easy and obvious choice for those starting up a tube bending business. Our MDH tube benders are also to complement heavy production or prototyping divisions. As standard, this electric tube bending machine come with a hydraulic mandrel extractor, hydraulic clamp and pressure die, as a result it guarantees a good-quality bend finish. 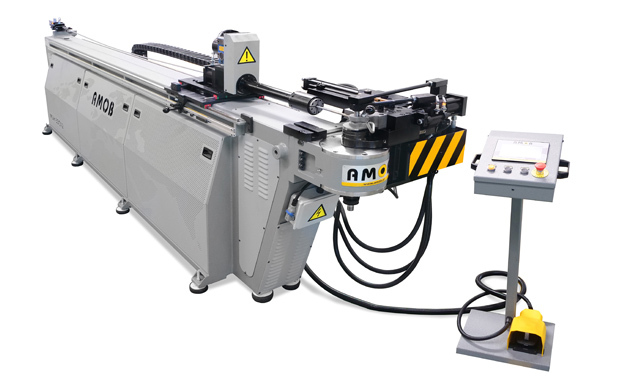 Available in two versions – NC1 and NC2 axis – these tube bending machines allow for bending complex tube geometries within seconds of programming. Machines from this range are are all equipped with AMOB NC touchscreen that is easy to operate controls. Hydraulic POB clamp: NC plane of bend positioner equipped with hydraulic clamp. Special propose tooling: On request, MDH series can be equipped with special tooling. Magnetic flip stops: Easy-to-setup, sequentially-adjustable magnetic flip stops for the X axis. User-friendly touch screen controller: The Electric NC Tube Bender MDH Series are all equipped with AMOB NC touchscreen easy-to-operate controls. Direct-acting pressure die cylinder: Pressure die cylinder is mounted in tube’s centerline plane to resist bending forces.